Tropic Reels Multispin Slot Guide & Review - Casino Answers! Tropic Reels is a 3-reel, 5-row multispin video slot that can be found at Playtech casinos, including Casino Del Rio and Titan Casino. 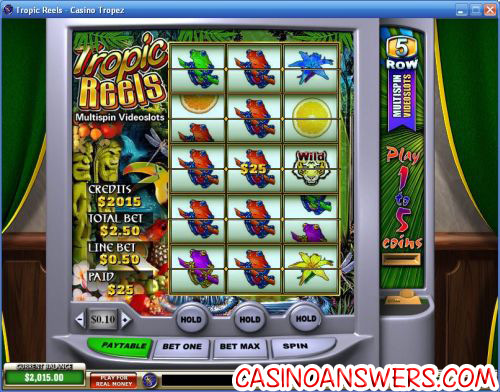 Tropic Reels has a Hold feature that you can normally only find only Fruit machines.Play at this years #1 online casino for United States - Slots.LV. 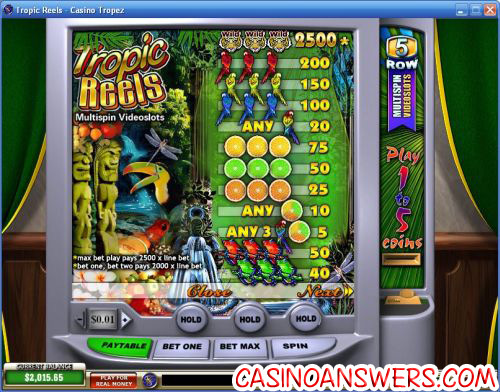 If you can’t tell by the name, Tropic Reels is a slot machine with a very tropical theme. The symbols in Tropic Reels consist of parrots, tropical fruits such as grapefruits and tree frogs. This gives the slot a very cool look. If you want to play Tropic Reels and are looking for a great casino to play it at, we recommend you try Casino Del Rio, the world’s first eco-casino. It’s got a similar type of atmosphere that you get with Tropic Reels and offers a nice 100% up to $100 signup bonus. If you plan on sticking around, you can get a 50% bonus up to $50 for the next ten months. As an added bonus, for every new player that signs up at Casino Del Rio, they will plant a tree. What is a multispin slot machine? A multispin slot machine is a slot machine that you can spin multiple times. It gives the player more of a chance to affect the outcome of the game. However, it must be emphasized that even multispin slot machines are games of luck, rather than games of skill. Does Tropic Reels have a progressive jackpot? Tropic Reels lacks a progressive jackpot. However, Casino Del Rio does have several other progressive jackpot slots, including Beach Life, Cinerama, Diamond Valley, Fruitmania, Gold Rally, Safecracker and more. I’m a US-based player. Where can I play Tropic Reels? Unfortunately, due to the UIGEA, American players cannot play at the Playtech casinos which host the Tropic Reels slot machine. However, there are several US-friendly online casinos with equally fun slots, such as Go Casino. Go Casino features lots of slots tournament and a deep variety of slots to choose from. Where can I play the Troop Reels flash game?